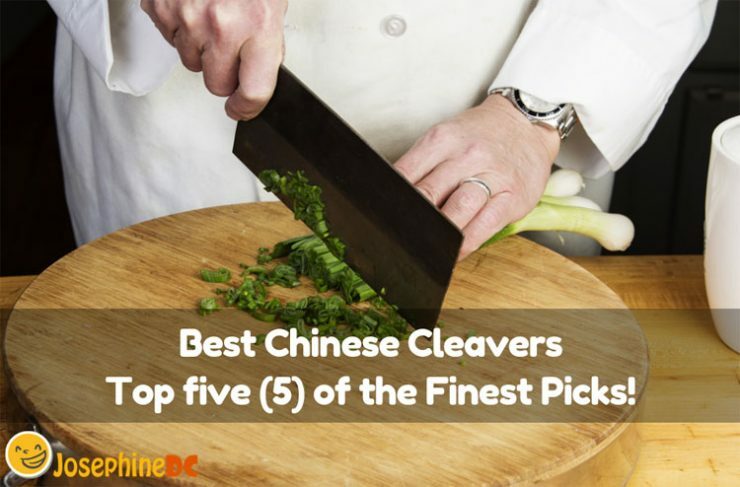 Best Chinese Cleavers: Top five (5) of the Finest Picks in 2019 ! Amongst all the kitchen knives, a cleaver is the most practical type to choose since it is flexible when it comes to culinary applications. Being a multipurpose tool, it gives me the convenience that I need during a hectic day of cooking. Although cleavers are not usually associated as a female choice, I tell you, that the best Chinese cleavers around do magic with its precise performance. Disregard the thought that cleavers are just for butchering and chopping tough meat. The best Chinese cleaver stands out from the rest of its kind since in contrast to what you imagine from horror movies; this type of cleaver is lighter and has a thinner blade. Its versatility covers from cutting poultry to slicing tiny strips of carrots. I can even use the flat rectangular surface to crush my garlic and use the same to transfer the tiny slices into the frying pan. Aside from that, I use the spine to pound my meat as well. Are you like me who spends more time cooking? Try the best Chinese cleavers and discover how a single tool can make your kitchen world easier. You may find it as your favorite too. I will introduce to you the finest collection for you to feast and see what comes out as the Chinese cleaver that could be the best! Are you familiar with Chinese Cleavers? What do you need to consider when buying a Chinese cleaver? If you are new with the different types of knives, the Chinese cleaver for one is the most versatile of all. I know that there are different shapes out there for a cleaver. However but what is commonly used and recognized as a Chinese cleaver is a rectangular shape that has a sharp blade and edge with a 16 degrees angle. Resembling a hatchet, it is frequently associated with butchering meats and bones. The flat and wide surface is also convenient for crushing any ingredient when cooking. Do not be fooled on buying the wrong kind of Chinese cleaver. Ignorant I was before when buying kitchen tools that I usually get scammed and end up bringing home a low-quality product. In the long run, I manage to keep up through experience and time. 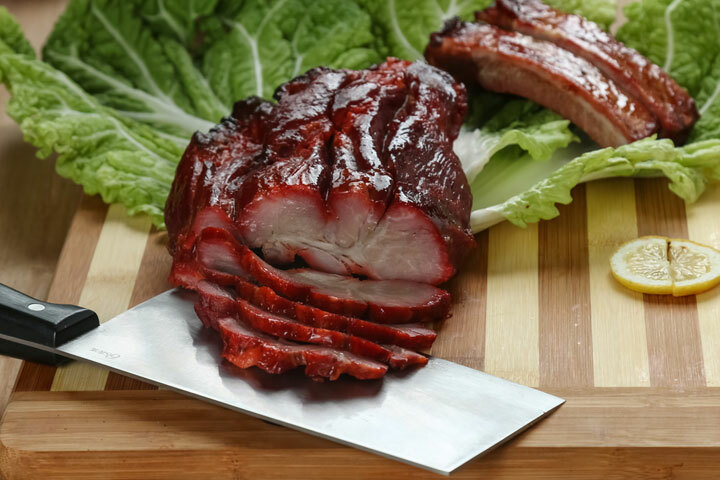 Here are some factors to keep in mind to ensure buying the best Chinese cleaver. Initially, you must already have an idea on what kind of cutting you need to apply when buying Chinese cleavers since it matters when it comes to size and weight. If you are a homebody that frequently minces, slice, and dice when cooking, you will be comfortable with small to medium size cleavers. These sizes should be shorter in length and have thinner blades (2mm). However, if you need to chop meat, bones, or whole chicken, it would be practical to choose a bigger one. A 7” length is an example of a bigger size that must also be harmonized with a thicker blade (8mm). Remember that the size of your cleaver must match the size of your hand for a perfect fit and limit of your strength. The weight, on the other hand, is vital in your ease to maneuver and lift the cleaver. A big cleaver is heavy especially when its construction is of solid materials. Take note that you need a tool that you can use with ease. I love to cook, but I am not that technical to be an expert on tooling materials. Nevertheless, I can share with you what I know about the materials that would make the best Chinese cleaver. Cleavers uses a particular type of stainless-steel material such as VG-10 and Friodur for the blades. It is not easy for me to remember the names, but you could Google their facts and learn their basic properties and their applications. I am sure though that any steel with a high level of carbon content is harder and can be used for the heavy-duty cutting process. Meanwhile, blades with a high chromium level are resistant to corrosion. The handle must also be verified for comfort and firmness of your grip while at work. For authentic looks and feel, I go for the wooden material and for matters of durability and less effort, a combination of wood and polymer is my pick. Lastly, I like to let you know that I always prefer a full tang construction when it comes to knives. If possible, get a full tang Chinese cleaver to ensure it will not break easily. Imagine a cleaver breaking when in use and how risky it would be. Now you know that Chinese cleavers do not use simple materials. Hence, being so, it involves ample care and upkeep. Learn to identify which type of material is suitable for a dishwasher or not. Personally, I prefer cleaning my cleaver manually using a mild soap to maintain its sharpness and precision. Cleavers with wooden handles, for example, are best to stay always dry if possible. I bought one with a hole on the blade portion so I can hang it and dry after cleaning. Shrug it off when people say Chinese cleavers are just for heavy butchering. Cleavers are meant for cutting meat, vegetables, and fruits, and are not for chopping hard bones. Know the reason why you want a cleaver. Pick one that is appropriate for your daily use. If you want to watch how a Chinese cleaver actually works, here is a video showing you how to use one. You will be astonished to see various functions a Chinese cleaver can offer. It should give you an idea of what to choose then. Focus clearly since Chinese cleavers may look the same at first glance, but when you take a closer look, you will discover the difference. With the buying guide, you should be able to purchase the product that is right for you. No worries, all the items in my list prove to be the best in the market today. They rate as the highest with positive reviews, sales, and recommendations from experts! Winco Chinese Cleaver ranks first with the highest number of positive reviews online and recommendations from users and experts. The corrosion resistant stainless steel (KC-301) blade measures 8” in length, 3.5” in width with a 5” wooden handle. The blade thickness is .10” and it weighs about 15 oz. Notice that the knife is full tang too (notice the three brass rivets that hold the wood with the full tang), making it more durable and safer when in use. By the way, as I did some test, the cleaver is somewhat magnetic, so I thought that maybe it has a certain level of carbon content in it. Although the product states that it is dishwasher-safe, I still prefer cleaning it manually to maintain the luster and the precision of the sharp edges. I suggest getting a sheath for extra protection. For you who makes a cleaver a multi-purpose knife and uses it frequently, I recommend sharpening it at least once a year to maintain better performance. This Chinese cleaver is hefty enough with a weight of one pound, but still, I ensure chopping bones at the joint part only to ensure a clean cut. Through time, I have mastered the correct aim not to miss the right spot. However, with this cleaver, I find cutting through a whole chicken is just a piece of cake. You can try slicing vegetables and fruits with it too, especially big ones like watermelons to see how it makes your life easier. The handle is smooth and easy to grip. The blade is heavy and rust-free. It is best in cutting through watermelons, pineapples, and other fruits. Not suitable for solid or hard objects to cut. Imarku offers a Chinese cleaver that performs well in your kitchen may it be for chopping, slicing, cutting, or however you deem find it useful. 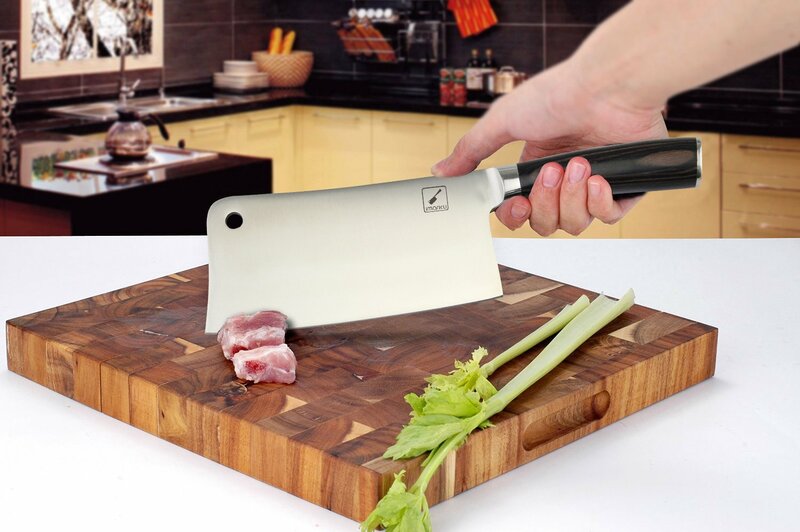 The cleaver has a high carbon stainless steel (100% 7CR17) blade that is rust resistant and easy to maintain its edge retention and sharpness. Thickness is 2.5mm, a blade length of 7” and weighs 1.2 lbs. Take note that I do not recommend the knife for dishwashers since it may damage the cutting edge. It is not also suitable for cutting frozen foods or exposing them to flame. In fact, cleaning it is so hassle-free that clean water and mild soap are all that it takes. I recommend wiping it off after with a soft and clean piece of cloth after washing. The hole that you can find in the top corner of the blade makes storage convenient. I just hang it after cleaning to dry. The high-quality wooden handle is comfortable to my grip, and it allows me to work with good strength. Certainly, PAKKA wood not only makes the handle smooth and safe to my fingers but also gives an antibacterial effect for my hands. Indeed, the tool is so versatile that I do not need to switch to another kind of knife during cooking. The product is durable and lightweight that it makes cutting fruits and vegetables fast and easy. 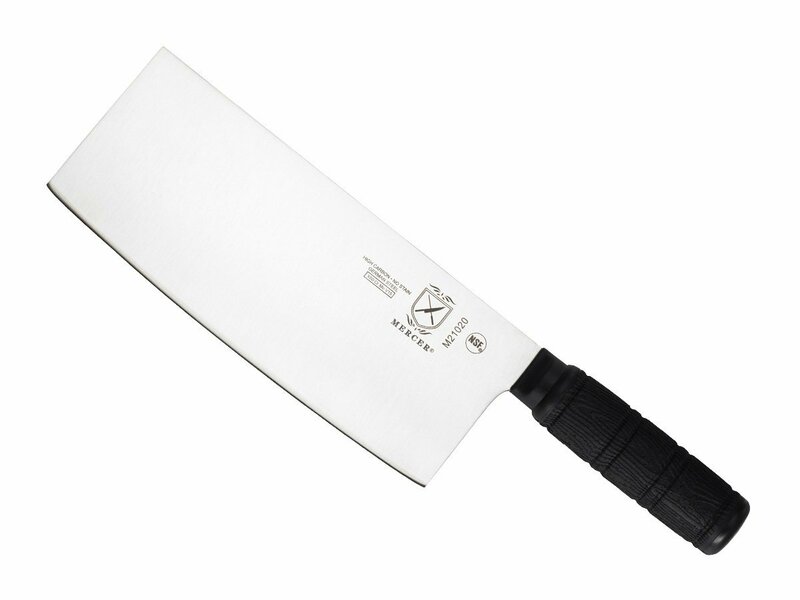 I also like to share that this Chinese cleaver comes with a first-class package that is attractive enough for a gift. Definitely, this Chinese Cleaver is worth an addition to your collection. The triple-riveted, ergonomically design of the Eldrin handle makes my clasp stress-free and relaxed during the chopping. Besides, the textured Santoprene handle that is slip resistant and its rounded spine enhance the quality of grip as well. The product has a shortened bolster that reveals the full blade edge that does not give you a hard time sharpening it. With a full tang design that runs the whole length of the handle, it offers superior balance. Mercer cleaver is proud of its one-piece precision forged construction of high carbon, no stain German cutlery steel that is rust, corrosion, discoloration resistant. However, it is a single grind at the right side of the blade making it a disadvantage for left-handed cooks. Notice that the taper-ground edge adds more assurance for stability, easy honing, long-lasting sharpness and high efficiency when cutting and chopping. Even when I do julienne carrots, the cleaver never disappoints me. Mercer Chinese cleavers are NSF certified. Thus, it meets the required standard for safety, quality, and performance. For specific dimensions, this cleaver measures 3 5/16” wide, 8” length, weighs around 8 oz., 2mm thickness, and 4 7/16” handle length. Vegetables do not stick to the blade. The Skylight Chinese cleaver is a bestseller for this review. The 7” kitchen/utility knife has superior material construction. Forged from German high carbon stainless steel, this Chinese meat cleaver guarantees its strength, hardness, wear, rust, stain, discoloration, and corrosion resistance. Its 17 degrees per side sharp blade and mirror that is hand-polished assures ultra-thin slicing, dicing, and cutting with slight work from your part. One reason why I like this product most is the ergonomically contoured handle that provides a continuous transition from blade to cleaver handle. The handle is proportioned, and the edge is double-level living no disadvantage for left-handed people. It also has a three (3) triple-rivet and fingers protective bolster that offers a secure and non-slip grip. My partner has a bigger hand than I do, but it does not keep her from using the cleaver with ease and comfort as well. 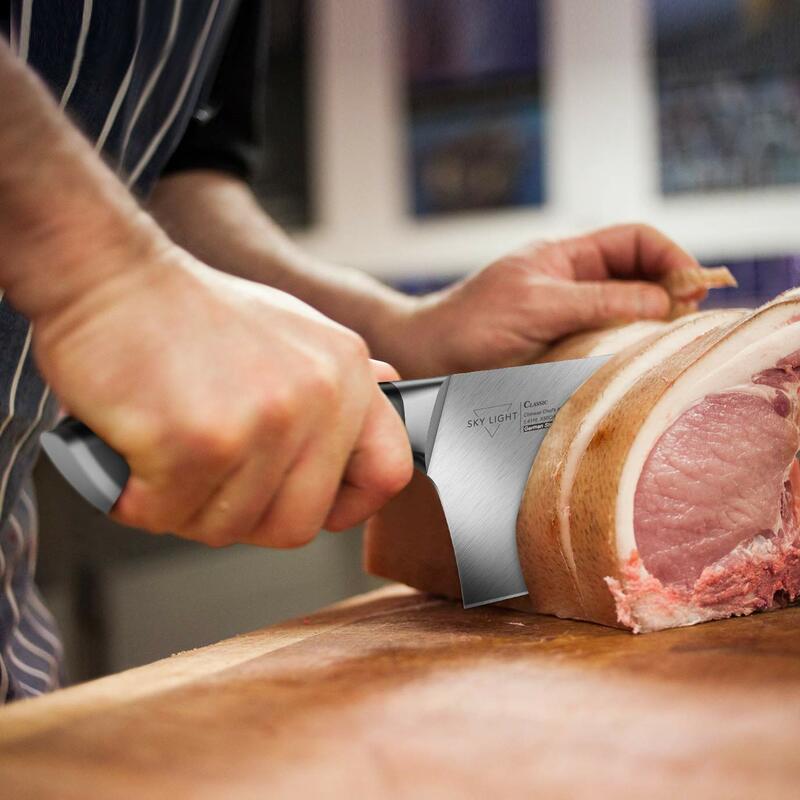 The bolster, however, ensures the balanced weight distribution so that the cleaver performs naturally when in use. Indeed Chinese cleavers are all-purpose kitchen knives. With its diversity, you can use this meat cleaver with all types of cutting. This product is easy to re-sharpen, clean and maintains its quality. Although this cleaver is suitable for dishwashers, I still think that manually washing my kitchen tools will help in maintaining its nice features. You would be happy to know that Skylight covers 100% satisfaction or money back guarantee. Buying it is never risky with its lifetime warranty against defects in material or workmanship. It has just the right weight. 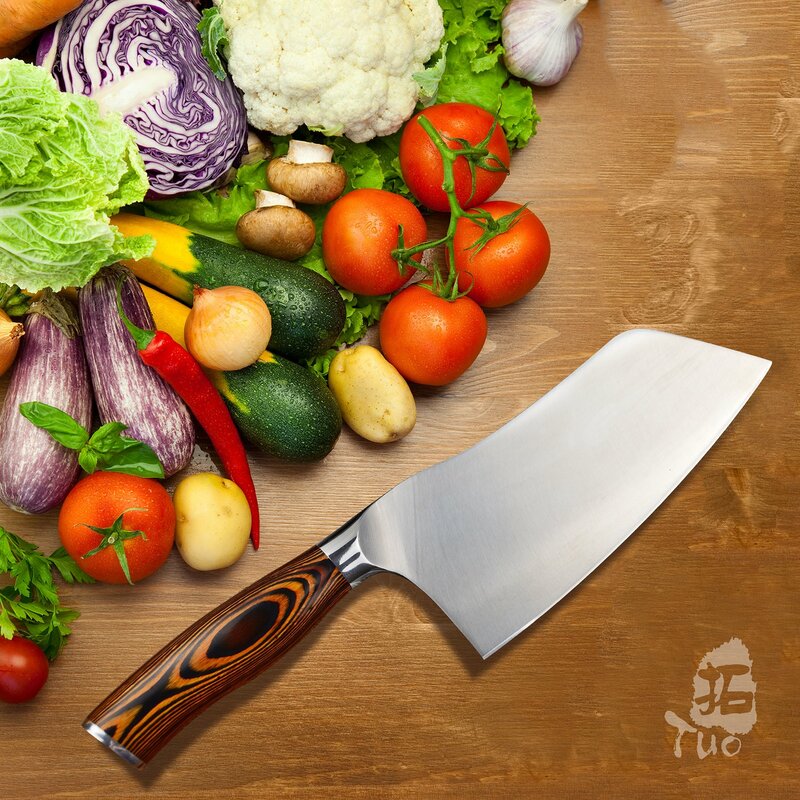 TUO 7” cutlery vegetable and meat Chinese cleaver are proud of its polished PAKKA wood handle. As Amazon’s choice for Chinese cleavers, it performs as expected. From the outstanding grain of the handle to the gentle curve of the blade, apparently, it is an ergonomic handle design for excellent comfort and robustness. I admire its extremely razor sharp, full tang, imported high carbon German stainless steel material with a hand-polished edge at 18 degrees per side. This product is precisely tempered and stain resistant with a hardness that reaches to HRC56. I consider the PAKKA wood (from Africa) as unique for every handle not mentioning its being luxurious and good-looking. The high-density wood handle inlay is oil proof and anti-corrosion. Therefore, it ensures that you will have a hygienic kitchen cleaver. Therefore, it means goodbye to blisters spots like I had with other brands. The Chinese cleaver weighs .75 lb., measures 3.15” in width, .09” in thickness, and 7” in length. Like the other items, this too offers 100% satisfaction or money back guarantee. This risk-free purchase is also ideal for gifts and giveaways. Comes with a towel to dry after cleaning. It feels solid, comfortable and high quality. Now, if your goal is cooking with speed and comfort, the best Chinese cleavers is exactly the knife that can help you to achieve it. It is convenient, useful, and versatile as it is. However, I suggest choosing it carefully by checking out the important factors which make it great. I hope that you found today your best Chinese cleaver that will be your favorite companion in your kitchen. Make the most out of it and enjoy cooking your favorite meals!